Independent seed testing company is able to better access, track, and control samples. 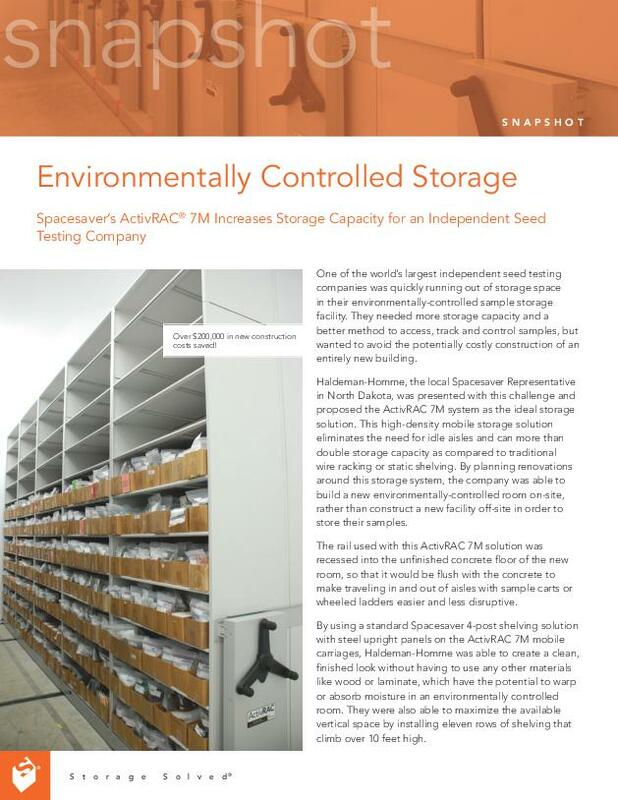 Halderman-Homme, the local Spacesaver Representative in North Dakota, was presented with this challenge and proposed the ActivRAC 7M® system as the ideal storage solution. This high-density mobile storage solution eliminates the need for idle aisles and can more than double storage capacity as compared to traditional wire racking or static shelving. By planning renovations around this storage system, the company was able to build a new environmentally-controlled room on-site rather than construct a new facility off-site in order to store their samples. The rail used with this ActivRAC 7M solution was recessed into the unfinished concrete floor of the new room, so that it would be flush with the concrete to make traveling in and out of aisles with sample carts or wheeled ladders easier and less disruptive.